I invited a group of cosmologists, experimentalists, theorists, and particle physicists and cosmologists. 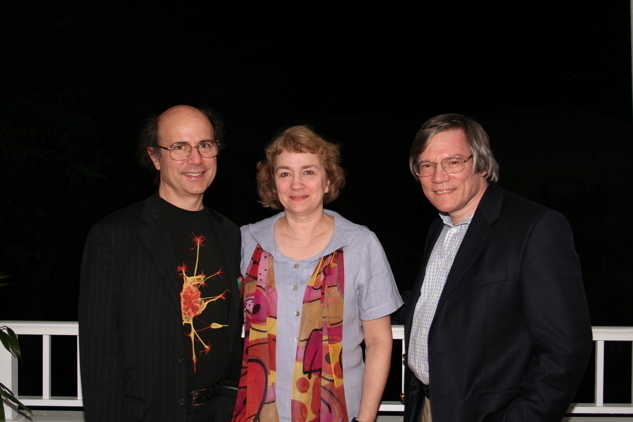 Stephen Hawking came; we had three Nobel laureates, Gerard 'tHooft, David Gross, Frank Wilczek; well-known cosmologists and physicists such as Jim Peebles at Princeton, Alan Guth at MIT, Kip Thorne at Caltech, Lisa Randall at Harvard; experimentalists, such as Barry Barish of LIGO, the gravitational wave observatory; we had observational cosmologists, people looking at the cosmic microwave background; we had Maria Spiropulu from CERN, who's working on the Large Hadron Collider — which a decade ago people wouldn't have thought it was a probe of gravity, but now due to recent work in the possibility of extra dimensions it might be. Physicist/cosmologist Lawrence Krauss, who recently was featured on Edge ("How Do You Fed-ex the Pope? 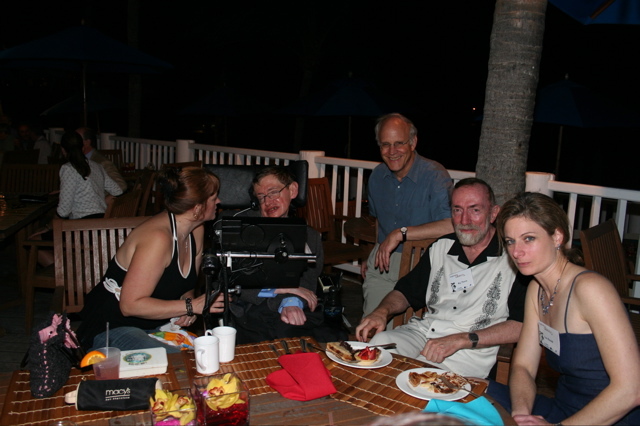 "), recently convened a physics conference on St. Thomas, which included an all-star cast of cutting-edge theorists and physicists. The topic of the meeting was "Confronting Gravity." Krauss intended to have "a meeting where people would look forward to the key issues facing fundamental physics and cosmology". They could meet, discuss, relax on the beach, and take a trip to the nearby private island retreat of the science philanthropist Jeffrey Epstein, who funded the event. For Krauss, what came out of the conference was the over-riding issue that "there appears to be energy of empty space that isn't zero! This flies in the face of all conventional wisdom in theoretical particle physics. It is the most profound shift in thinking, perhaps the most profound puzzle, in the latter half of the 20th century. And it may be the first half of the 21st century, or maybe go all the way to the 22nd century. Because, unfortunately, I happen to think we won't be able to rely on experiment to resolve this problem." "It's not clear to me", he says, "that the landscape idea will be anything but impotent. Ultimately it might lead to interesting suggestions about things, but real progress will occur when we actually have new ideas. If string theory is the right direction, and I'm willing to argue that it might be, even if there's just no evidence that it is right now, then a new idea that tells us a fundamental principle for how to turn that formalism to a theory will give us a direction that will turn into something fruitful. Right now we're floundering. We're floundering, in a lot of different areas." Other physicists, whether present at the conference or not, will no doubt feel diiferently. Edge looks forward to their comments. LAWRENCE M. KRAUSS, a physicist/cosmologist, is the Ambrose Swasey Professor of Physics and chairman of the Physics Department of Case Western Reserve University. He is the author of The Fifth Essence, Quintessence, Fear of Physics, The Physics of Star Trek, Beyond Star Trek, Atom, and Hiding in the Mirror. 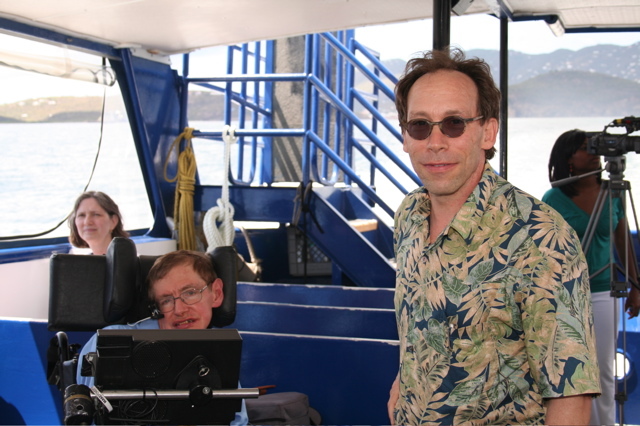 [LAWRENCE KRAUSS:] I just returned from the Virgin Islands, from a delightful event — a conference in St. Thomas — that I organized with 21 physicists. I like small events, and I got to hand-pick the people. The topic of the meeting was "Confronting Gravity. " I wanted to have a meeting where people would look forward to the key issues facing fundamental physics and cosmology. And if you think about it they all revolve in one way or another around gravity. Someone at the meeting said, well, you know, don't we understand gravity? Things fall. But really, many of the key ideas that right now are at the forefront of particle physics cosmology, relate to our lack of understanding of how to accommodate gravity and quantum mechanics. I wanted to have a series of sessions where we would, each of us, try and speak somewhat provocatively about what each person was thinking about, what the key issues are, and then have a lot of open time for discussion. And so the meeting was devoted with a lot of open time for discussion, a lot of individual time for discussion, as well as some fun things like going down in a submarine, which we did. 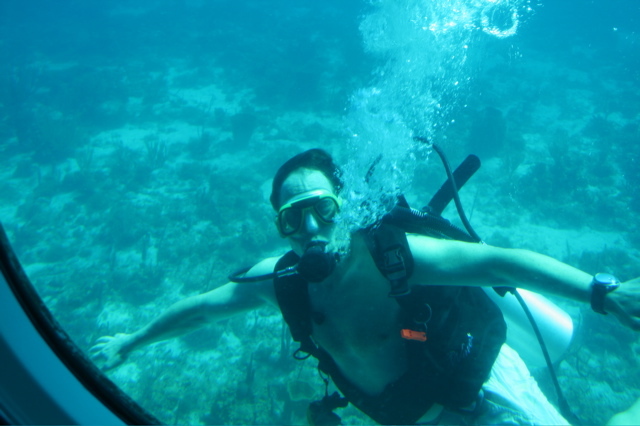 It was a delightful event, where we defied gravity by having buoyancy, I guess. I came away from this meeting realizing that the search for gravitational waves may be the next frontier. For a long time I pooh-poohed it in my mind, because it was clear it's going to be a long time before we could ever detect them if they're there, and it wasn't clear to me what we'd learn — except that they exist. But one of the key worries I have as a cosmologist right now is that we have these ideas and these parameters and every experiment is consistent with this picture, and yet nothing points to the fundamental physics beneath it. It's been very frustrating for particle physicists, and some people might say it's led to sensory deprivation, which has resulted in hallucination otherwise known as string theory. And that could be true. But in cosmology what we're having now is this cockamamie universe. We've discovered a tremendous amount. We've discovered the universe is flat, which most of us theorists thought we knew in advance, because it's the only beautiful universe. But why is it flat? It's full of not just dark matter, but this crazy stuff called dark energy, that no one understands. This was an amazing discovery in 1998 or so. What's happened since then is every single experiment agrees with this picture without adding insight into where it comes from. Similarly all the data is consistent with ideas from inflation and everything is consistent with the simplest predictions of that, but not in a way that you can necessarily falsify it. Everything is consistent with this dark energy that looks like a cosmological constant; which tells us nothing. It's a little subtle, but I'll try and explain it. We've got this weird antigravity in the universe, which is making the expansion of the universe accelerate. Now: if you plug in the equations of general relativity, the only thing that can 'anti-gravitate' is the energy of nothing. Now: this has been a problem in physics since I've been a graduate student. It was such a severe problem we never talked about it. When you apply quantum mechanics and special relativity, empty space inevitably has energy. The problem is, way too much energy. It has 120 orders of magnitude more energy than is contained in everything we see! Now that is the worst prediction in all of physics. You might say, if that's such a bad prediction, then how do we know empty space can have energy? The answer is, we know empty space isn't empty, because it's full of these virtual particles that pop in and out of existence, and we know that because if you try and calculate the energy level in a hydrogen atom, and you don't include those virtual particles, you get a wrong answer. One of the greatest developments in physics in the 20th century was to realize that when you incorporate special relativity in quantum mechanics you have virtual particles that can pop in and out of existence, and they change the nature of a hydrogen atom, because a hydrogen atom isn't just a proton and electron. That's the wrong picture, because every now and then you have an electron positron pair that pops into existence. And the electron is going to want to hang around near the proton because it's oppositely charged, the positron is going to be pushed out to the outskirts of the atom, and while they're there they change the charged distribution in the atom in a very small, but calculable, way. Feynman and others calculated that effect, which allows us to get agreement between theory and observation at the level of nine decimal places. It's the best prediction in all of science. There's no other place in science where, from fundamental principles, you can calculate a number and compare it to an experiment at nine decimal places like that. But then when we ask, if they're there, how much should they contribute to the energy in the universe, we come up with the worst prediction in physics. it says if empty space has so much energy we shouldn't be here. And physicists like me, theoretical physicists, knew they had the answer. They didn't know how to get there. It reminds me or the Sidney Harris cartoon where you've got this big equation, and the answer, and the middle step says "And then a miracle occurs". And then one scientist says to another, "I think you have to be a little more specific at this step right here". The answer had to be zero. The energy of empty space had to be precisely zero. Why? Because you've got these virtual particles that are apparently contributing huge amounts of energy, you can imagine in physics, how underlying symmetries in nature can produce exact cancellations — that happens all the time. Symmetries produce two numbers that are exactly equal and opposite because somewhere there's an underlying mathematical symmetry of equations. So that you can understand how symmetries could somehow cause an exact cancellation of the energy of empty space. There appears to be energy of empty space that isn't zero! This flies in the face of all conventional wisdom in theoretical particle physics. It is the most profound shift in thinking, perhaps the most profound puzzle, in the latter half of the 20th century. And it may be the first half of the 21st century, or maybe go all the way to the 22nd century. Because, unfortunately, I happen to think we won't be able to rely on experiment to resolve this problem. But what you couldn't understand was how to cancel a number to a hundred and twenty decimal places and leave something finite left over. You can't take two numbers that are very large and expect them to almost exactly cancel leaving something that's 120 orders of magnitude smaller left over. And that's what would be required to have an energy that was comparable with the observational upper limits on the energy of empty space. We knew the answer. There was a symmetry and the number had to be exactly zero. Well, what have we discovered? There appears to be this energy of empty space that isn't zero! This flies in the face of all conventional wisdom in theoretical particle physics. It is the most profound shift in thinking, perhaps the most profound puzzle, in the latter half of the 20th century. And it may be the first half of the 21st century, or maybe go all the way to the 22nd century. Because, unfortunately, I happen to think we won't be able to rely on experiment to resolve this problem. When we look out at the universe, if this dark energy is something that isn't quite an energy of empty space but its just something that's pretending to be that, we might measure that it's changing over time. Then we would know that the actual energy of empty space is really zero but this is some cockamamie thing that's pretending to be energy of empty space. And many people have hoped they'd see that is because then you wouldn't need quantum gravity, which is a theory we don't yet have, to understand this apparent dark energy. Indeed, one of the biggest failures of string theory's many failures, I think, is it never successfully addressed this cosmological constant problem. You'd think if you had a theory of quantum gravity, it would explain precisely what the energy of empty space should be. And we don't have any other theory that addresses that problem either! But if this thing really isn't vacuum energy, then it's something else, then you might be able to find out what it is, and learn and do physics without having to understand quantum gravity. The problem is, when we actually look out, every measure we've made right now is completely consistent with a constant energy in the universe over cosmological time. And that's consistent with the cosmological constant, with vacuum energy. So if you make the measurement that it's consistent with that, you learn nothing. Because it doesn't tell you that it is vacuum energy, because there could be other things that could mimic it. The only observation that would tell you, give you positive information is if you could measure it was changing over time. Then you'd know it wasn't vacuum energy. All if we keep measuring this quantity better and better and better, it is quite possible that we will find out it looks more and more like a vacuum energy, and we're going to learn nothing. And the only way to resolve this problem will be to have a theory. And theories are a lot harder to come by than experiments. Good ideas are few and far between. And what we're really going to need is a good idea, and it may require an understanding of quantum gravity, or it may require that you throw up your hands, which is what we're learning that a lot of people are willing to do. In the Virgin Islands we had a session on the anthropic principle, and what is surprising is how many physicists have really said, you know, maybe the answer is an anthropic one. Twenty years ago if you'd asked physicists if they would hope that one day we'll have a theory that tells us why the universe is the way it is, you would have heard a resounding 'Yes'. They would all say 'that's why I got into physics'. They might paraphrase Einstein, who said, while referring to God but not really meaning God, that the question that really interested him is did God have any choice in the creation of the universe. What he really meant by that was, is there only one consistent set of laws that works. If you changed one — if you twiddled one aspect of physical reality — would it all fall apart? Or are there lots of possible viable physical realities? Twenty years ago most physicists would have said, on the basis of 450 years of science, that they believed that there's only one allowed law of nature that works, that ultimately we might discover fundamental symmetries and mathematical principles that cause the nature to be the way it is, because it's always worked that way. So that is the way science has worked. But now because of this energy of empty space — which is so inexplicable that if it really is an energy of empty space, the value of that number is so ridiculous that it's driven people to think that maybe, maybe it's an accident of our environment, that physics is an environmental science — that certain fundamental constants in nature may just be accidents, and there may be many different universes, in which the laws of physics are different, and the reasons those constants have the values they have might be — in our universe — might be because we're there to observe them. This is not intelligent design; it's the opposite of intelligent design. It's a kind of cosmic natural selection. The qualities we have exist because we can survive in this environment. That's natural selection, right? If we couldn't survive we wouldn't be around. Well, it's the same with the universe. We live in a universe — in this universe — we've evolved in this universe, because this universe is conducive to life. There may be other universes that aren't conducive to life, and lo and behold there isn't life in them. That's the kind of cosmic natural selection. We're allowed to presume anything; the key question is, is it a scientific question to presume there are other universes? That's something we were looking at in the meeting as well. I wrote a piece where I argued that is a disservice to evolutionary theory to call string theory a theory, for example. Because it's clearly not a theory in the same sense that evolutionary theory is, or that quantum electrodynamics is, because those are robust theories that make rigorous predictions that can be falsified. And string theory is just a formalism now that one day might be a theory. And when I'm lecturing, talking about science, people say to me, evolution is just a theory, I say, in science theory means a different thing, and they say, what do you mean? Look at string theory, how can you falsify that? It's no worse than intelligent design. I do think there are huge differences between string theory and intelligent design. People who are doing string theory are earnest scientists who are trying to come up with ideas that are viable. People who are doing intelligent design aren't doing any of that. But the question is, is it falsifiable? And do we do a disservice to real theories by calling hypotheses or formalisms theories? Is a multiverse — in one form or another — science? In my sarcastic moments I've argued that the reason that some string theorists have latched onto the landscape idea so much is that since string theory doesn't make any predictions, it's good to have a universe where you can't make any predictions. But less sarcastically, if you try and do science with idea, you can try and do real science and calculate probabilities. But whatever you do, you find that all you get is suggestive arguments. Because if you don't have an underlying theory, you never know. I say, well, what's the probability of our universe having a vacuum energy if it is allowed to vary over different universes? Then I come up with some result which is interesting, and Steven Weinberg was one of the first people to point out, that if the value of the energy of empty space was much greater than it is, then galaxies wouldn't have formed, and astronomers wouldn't have formed, so that gave the anthropic argument that, well, maybe that's why it is what it is — it can't be much more. But the problem is, you don't know if that's the only quantity that's varying! Maybe there are other quantities that are varying. Whatever you're doing is always a kind of ad hoc suggestive thing at best. You can debate it, but it doesn't lead very far. It's not clear to me that the landscape idea will be anything but impotent. Ultimately it might lead to interesting suggestions about things, but real progress will occur when we actually have new ideas. If string theory is the right direction, and I'm willing to argue that it might be, even if there's just no evidence that it is right now, then a new idea that tells us a fundamental principle for how to turn that formalism to a theory will give us a direction that will turn into something fruitful. Right now we're floundering. We're floundering, in a lot of different areas. As a theorist, when I go to meetings I often get much more out of the experimental talks. Because I often know what's going on in theory, or at least I like to think I do. I was profoundly affected by the experimental talks. In principle, we are now able to be sensitive to gravitational waves that might change a meter stick that's three kilometers long by a length equal to less than the size of atom!. It's just amazing that we have the technology to do that. While that is not actually detecting any gravitational waves, there's no technological obstructions, to going to the advanced stage. Gravitational waves may be indeed allow us a probe that might take us beyond our current state of having observations that don't lead anywhere. I was very impressed with these findings. At the same time, that we had a talk from Eric Adelberger at the University of Washington, who's been trying to measure Newton's Law on small scales. You might think, who would want to measure Newton's Law on small scales? But one of the suggestions for extra dimensions is that on small scales and gravity has a different behavior. There has been some tantalizing evidence that went through the rumor mills that had suggested that in these experiments in Seattle they were seeing evidence for deviations from Newton's Theory. And Attleburger talked about some beautiful experiments. As a theorist, I'm just always amazed they can even do these experiments. And gave some new results, there are some tentative new results, which of course are not a surprise to me, that suggest that there is as yet no evidence for a deviation from Newton's Theory. Many of the papers in particle physics over the last five to seven years have been involved with the idea of extra dimensions of one sort or another. And while it's a fascinating idea, but I have to say, it's looking to me like it's not yet leading anywhere. The experimental evidence against it is combining with what I see as a theoretical diffusion — a breaking off into lots of parts. That's happened with string theory. I can see it happening with extra-dimensional arguments. We're seeing that the developments from this idea which has captured the imaginations of many physicists, hasn't been compelling. Right now it's clear that what we really need is some good new ideas. Fundamental physics is really at kind of a crossroads. The observations have just told us that the universe is crazy, but hasn't told us what direction the universe is crazy in. The theories have been incredibly complex and elaborate, but haven't yet made any compelling inroads. That can either be viewed as depressing or exciting. For young physicists it's exciting in the sense that it means that the field is ripe for something new. The great hope for particle physics, which may be a great hope for quantum gravity, is the next large particle accelerator. We've gone 30 years without a fundamentally new accelerator that can probe a totally new regime of the sub-atomic world. We would have had it if our legislators had not been so myopic. It's amazing to think that if they hadn't killed the superconducting Super Collider it would have been already been running for ten years. The Large Hadron Collider is going to come on-line next year. And one of two things could happen: It could either reveal a fascinating new window on the universe and a whole new set of phenomena that will validate or refute the current prevailing ideas in theoretical particle physics, supersymmetry etc, or it might see absolutely nothing. I'm not sure which I'm rooting for. But it is at least a hope, finally, that we may get an empirical handle that will at least constrain the wild speculation that theorists like me might make. Such a handle comes out of the impact of the recent cosmic microwave background (CMB) studies on Inflation Theory. I read in the New York Times that Alan Guth was smiling, and Alan Guth was sitting next to me at the conference when I handed him the article. He was smiling, but he always smiles, so I didn't know what to make much of it, but I think that the results that came out of the cosmic microwave background (CMB) studies were twofold. Indeed, as the Times suggested, they validate the notions of inflation. But I think that's just journalists searching for a story. Because if you look at what quantitatively has come out of the new results they're exactly consistent with the old results. Which also validate inflation. They reduce the error bars a little bit, by a factor of two. I don't know if that is astounding. But what is intriguing to me is that while everything is consistent with the simplest models, there's one area where there's a puzzle. On the largest scales, when we look out at the universe, there doesn't seem to be enough structure — not as much as inflation would predict. Now the question is, is that a statistical fluke? That is, we live in one universe, so we're a sample of one. With a sample of one, you have what is called a large sample variance. And maybe this just means we're lucky, that we just happen to live in a universe where the number's smaller than you'd predict. But when you look at CMB map, you also see that the structure that is observed, is in fact, in a weird way, correlated with the plane of the earth around the sun. Is this Copernicus coming back to haunt us? That's crazy. We're looking out at the whole universe. There's no way there should be a correlation of structure with our motion of the earth around the sun — the plane of the earth around the sun — the ecliptic. That would say we are truly the center of the universe. The new results are either telling us that all of science is wrong and we're the center of the universe, or maybe the data is imply incorrect, or maybe it's telling us there's something weird about the microwave background results and that maybe, maybe there's something wrong with our theories on the larger scales. And of course as a theorist I'm certainly hoping it's the latter, because I want theory to be wrong, not right, because if it's wrong there's still work left for the rest of us.